Effectively managing system resources in growing UNIX server environments has become a critical task. Each workload on the server must be assured the appropriate amount of system resources without penalizing mission-critical applications. AIX 5L Workload Manager provides a great set of tools and functionalities to efficiently accomplish this. 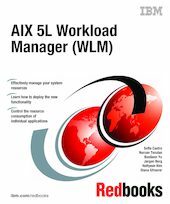 This IBM IBM Redbooks publication exploits the entire functionality of AIX 5L Workload Manager, which has been enhanced in many ways since its introduction with AIX V 4.3.3. The new manual assignment feature allows you to separate, for example, multiple instances of a database. An API allows you to perform all the WLM administration and configuration tasks from a program. A step-by-step guide is provided for planning and configuring AIX WLM through file editing, AIX commands, the System Management Interface Tool (SMIT), or Web-based System Manager (WSM). Real-life examples have been added to demonstrate the impact and benefits of using AIX Workload Manager. This IBM book is the ultimate guide for system architects, technical support specialists, and system administrators to planning, implementing, and administering a Workload Manager solution in a consolidated server environment.